A STEREO Heliospheric Imager (HI-1A) image taken on March 7, 2010 (left) with two variable stars highlighted in the image. The varying brightness of the two stars, V837 Tau and V1129 Tau are shown (right top and bottom, respectively). Two NASA satellites built to study the sun have discovered 122 previously unknown sets of twin stars, scientists say. "We've used the stars to calibrate the instruments," researcher Danielle Bewsher of the University of Central Lancashire told SPACE.com in an email interview. "Because our calibration has been made to a high standard, [we] knew that we could subsequently do science with the background stars." Artist's concept of the STEREO spacecraft observing a coronal mass ejection. When there's no CME to be found, STEREO still gathers images of the background stars. Stereo's imagers don't study the sun directly. Instead, they point slightly to the right of it, keeping our star's powerful rays out of the sensitive cameras' field of view. 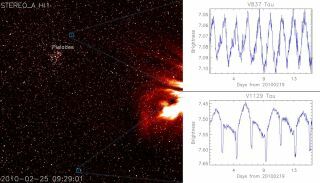 The same instruments that gather precise data on solar eruptions known as coronal mass ejections also register minute changes in brightness from the stars shining in the background. In addition to finding more than 100 new eclipsing binaries, the team also gathered data on 141 previously identified pairs. Binary stars abound in the galaxy. But eclipsing binaries are relatively hard to find, because in order to observe one star passing in front of the other, the two must be in a direct line of sight from the point of observation. The previously undiscovered eclipsing binaries don't tend to have a large change in brightness, Bewsher said. This suggests that the reason they weren't found earlier was because previous instruments just weren't sensitive enough. Because of the interaction of one star on another, "eclipsing binaries allow for more detailed studies of their host stars," said Bewsher. "A catalogue of bright EBs amenable to follow-up observations would therefore be very useful to a wide range of astronomers." In addition to searching for pairs of stars, the U.K. team hoped to locate a few alien planets as well. Specifically, they looked for transiting planets — bodies that, like eclipsing binaries, pass between their parent star and the Earth. The slight dimming in brightness caused by the planets' passage can reveal their presence. "The analysis would have been most sensitive to a transiting exoplanet with a period of less than about 6.5 days," Bewsher said. This is because each star only stays in the frame of STEREO's imagers for 19.44 days. The only candidate found by the team was determined to be too large and too massive to be a planet. Instead, it seems to be a brown dwarf, a failed star with a mass between that of giant planets and small stars. Follow-up measurements are in progress to verify its identity. Most of the team's data comes from only one of the imagers on the STEREO Ahead observatory. The field of the second imager covers much of the satellite's path, affecting signal detection. The team has been working steadily on analyzing the captured images stored in the camera, as well as developing tools to work with the information gleaned by the second orbiter. The forthcoming data should reveal a similar wealth of new information, researchers said. The team presented some initial results in April at the Royal Astronomical Society's National Astronomy Meeting in Wales. They will be detailed in an upcoming issue of the journal Monthly Notices of the Royal Astronomical Society.